As the Upper West Side rapidly developed, churches—Roman Catholic, Episcopalian, Lutheran, and Presbyterian among them—scrambled to established missions and chapels for the expanding population. In 1880 the Methodists joined the movement. Only a few months later the Missionary Society had acquired the vacant lots at Nos. 123 and 125 West 71st Street, between Columbus and Amsterdam Avenues. Within the year architect Stephen Decatur Hatch was at work on the design. The architect of the United States War Department in the 1860s, Hatch’s career had flourished by now. He was well-known for his large commercial buildings like the Gilsey House Hotel and the Robbins &Appleton Building. The stone ecclesiastical structure on West 71st Street would be far more intimate. Three stories tall, its angles, gables and bell tower were the epitome of 1880s architectural taste. Hatch filled the top of the central gable with quilt-like stonework, borrowed from the currently rampant Queen Anne style. The blocks around St. Andrew’s Chapel filled with upscale rowhouses. By 1895 its membership was sufficient for the Missionary Society to consider elevating St. Andrew’s to church status. Minutes of the meeting of the Board of Managers on May 8, 1865 recorded the opinion that “the neighborhood of the church was rapidly filling with the residences of intelligent and prosperous citizens; and that the dignity and influence of the Church would be materially increased” by organizing St. Andrew’s own Board of Trustees. A month later, on June 12, 1885, the chapel became St. Andrew’s Methodist Episcopal Church. The pulpit in the 19th century was often used as much to preach the Gospel as it was to vent the political opinions of the clergy. And so it was on Sunday March 30, 1889 when the enraged pastor Rev. Dr James M. King lashed out against proposed public school legislation. The “farewell service” was held in St. Andrew’s Methodist Church on the night of March 16, 1890. On April 26 the Real Estate Record and Builders’ Guide reported that the 71st Street church had been delivered “vacant” to John T. Farley for $40,000 five days earlier. The price, about $1 million today, would help offset the $100,000 cost of the new St. Andrew’s. Farley was a trustee of the four-year old Lutheran Gnaden Kirche, or Grace German Lutheran Church. 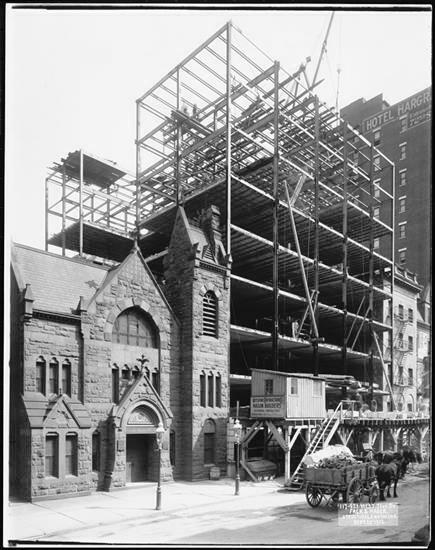 While the German population of New York City was centered on the Lower East Side and, to a lesser extent at this time, in Yorkville; the German Lutheran community on the West Side was sufficient to support the church. Like the Reverend James King had been, the Reverend George U. Wenner was displeased with the public school system. On January 30, 1906 he told a meeting of ministers in the United Charities Building of the alternative he had established at Grace Church. The penalty for not attending was severe. Under the pastorate of John Andrew Weyl the congregation weathered the uncomfortable World War I years. At a time when German-born New Yorkers were required to register as “enemy aliens,” the services continued to be conducted in German. On Valentine’s Day, 1924, a massive fire tore through the Church of Grace, essentially gutting the interiors. Damages amounted to around $25,000. Reverend Weyl would continue to lead the Lutheran Church of Grace until 1931—a remarkable 35 years in the pulpit. Bosch’s father, the Rev. Frederick H. Bosch, was pastor of the St. Paul’s Evangelical Lutheran Church, uptown at No. 147 West 123rd Street. The familial connection would play an important part in the history of both churches later on. At the time Walter Ziegfried, the church’s caretaker, had a room on the first floor of the church. Tragically, at around 6 p.m. on February 16, 1935 the church organist, C. A. Anderson, discovered the 40-year old dead on the studio couch in his room. With the windows closed against the cold winter air, Ziegfried had not noticed that the flame in the gas water heater had blown out. Unaware, he was overcome with the gas that slowly filled the small room. Rev. Frederick H. Bosch and his son, Edmund, now shared the pulpit of the Church of Grace. But the co-pastorate would be short lived. On March 30, 1941, with World War II raging in Europe, the Rev. Edmund Bosch gave his farewell sermon. “He has been called to serve as chaplain with the Regular Army,” reported The Times. As it had decades earlier, the German church continued on through the war, while enduring heavily anti-German sentiments. By now, however, the congregation was mixed and while Rev. Frederick Bosch continued to conduct one service in German, other ministers delivered sermons in English. The two congregations were officially merged on September 28, 1944 when the name was changed to Grace and St. Paul’s Church. After serving St. Paul’s for 40 years and the combined churches for five, Frederick H. Bosch died at the age of 73 in 1944. His funeral was held in Grace and St. Paul’s Church on the evening of April 4. Urich, who had been blind from birth, proved to be a strong and beloved pastor. His affliction was rarely mentioned; other than instances like that on September 27, 1954 when the church was visited by 75 blind worshipers. He served as pastor for seven years until his death in 1958. As early as 1961 the church presented plays. On January 29 that year Mary Magdalene was staged by the Vesper Theater. Then in 1973 it became the initial home of a professional theater group sponsored by local artists and the community called Grace and St. Paul’s Church Theater. A more than $1 million restoration and renovation was begun in 1988. Hemmed in by towering buildings, Hatch’s picturesque chapel is easily overlooked; yet it continues to serve the neighborhood of “intelligent and prosperous citizens” as it did 135 years ago.